"A yummy BBQ treat, fast yummy turkey burgers, great for camping..."
In a bowl, mix the turkey, peppers, and feta cheese. Season with salt and pepper. Form the mixture into 4 patties. Cook patties about 8 minutes per side on the prepared grill, to an internal temperature of 180 degrees F (85 degrees C). 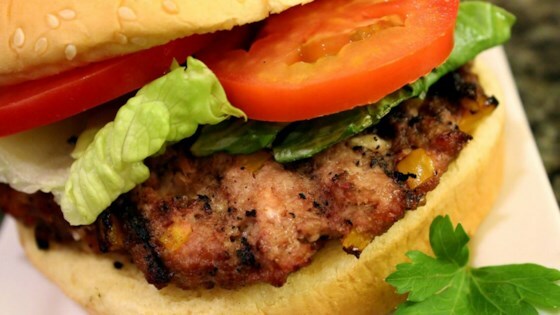 This is one of my FAVORITE turkey burger recipes! There is such a nice melody of flavors between the peppers, feta and meat. This is a huge hit at my house. Give this recipe a try! This was great! Super fast and easy.. everyone loved it.